I didn’t have too much trouble going to sleep around 9:30 p.m. Saturday night, but I did wake up around 3:30 a.m. and had trouble going back to sleep. The excitement of race day kicked in early! I got up and used the coffee maker to brew one cup of coffee and heat one cup of water for oatmeal. The coffee tasted great but the oatmeal I had to choke down. I was still pretty nervous but also thrilled that race day was finally happening! I headed out in the car around 5 a.m. and arrived to find transition open (it wasn’t supposed to open til 5:15). I managed to snag a prized spot on the end of a rack for my wave, #8. It was strange to be out there at 5:15 in the dark, but there was a nice energy under the lights. I was all set up by 5:45 and even took my bike to the free bike service booth for the guy to pump my tires and check my gears/shifting and have him put it in the right gear for me to get started on the bike in the race. I re-racked my bike and was all set. My SheROX volunteer mentor Megan had looked me up on Facebook and she approached me to say hello and answer any last minute questions. I had her talk me through where the Run In, Bike Out, Bike In, Run Out locations were and brainstorm how I could best get around the transition area quickly. She helped ease my mind a lot. I hustled back to the hotel to pick up Mike and the girls. It was hard for them to get up early but they did it with the promise of food. We got back to the race area at 6:30 right before the officials closed the roads. I could have parked and walked but it was nice that we made it before we had to do that. I had gotten in my wetsuit in the hotel. It helped to wear my wetsuit for 45 minutes before the race because I got it adjusted properly and got used to it and got rid of the choking feeling it gives me. Once I was all set up in transition and in my swim gear and at the proper place with the other athletes, I felt less anxious. Still a little nervous but just enough to be good for me for the race. The race officials went over the water course, which was a little different than the diagram that had been on the web. Thank goodness there were huge orange buoys to mark the sprint course, and yellow buoys for the super sprint. We all stood at attention for the national anthem. Then the waves started going, starting with the two elite athletes. It helped to watch those waves go to know best how to position myself and get to the start line. 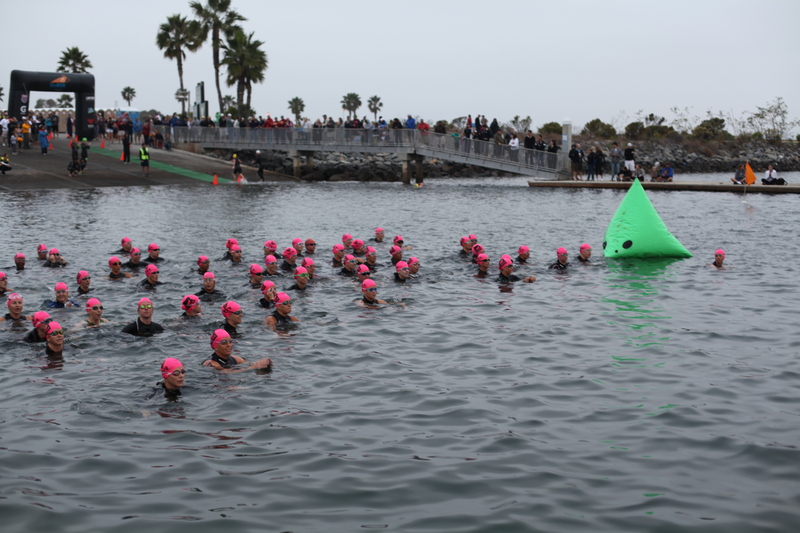 It was an in-water start at Mission Bay. 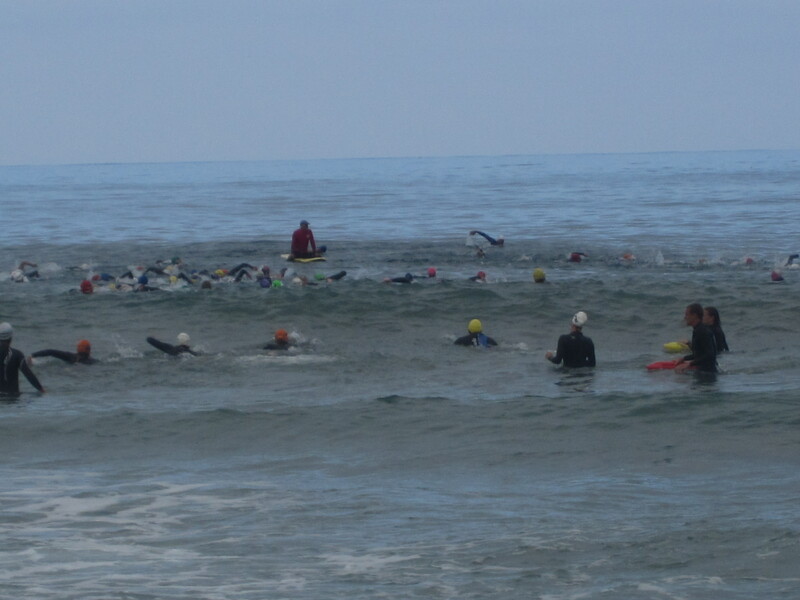 Go over the timing mat, down the ramp, and then swim out to the green start buoys and tread water. Some of the waves walked as far as they could instead of swimming, and that meant that when the starting horn sounded a minute or so later, they weren’t at the start line! I made sure I was out front and ready to go. 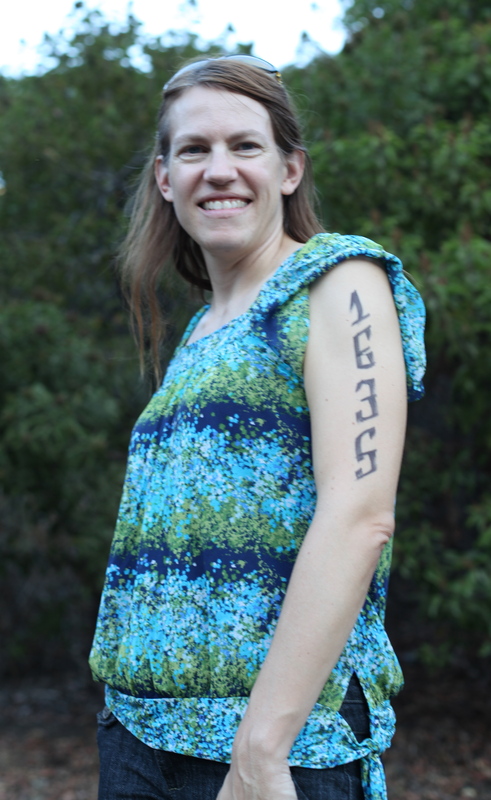 It annoyed little rule-follower-me that some of the other women in my wave got 5-10 feet in front of the start line. I didn’t say anything though. This race was me vs. me and I didn’t need to worry about them. I love an in-water start as opposed to a shore start. I knew when the announcer said, “Racers on your mark” that it would only be a few seconds until the horn blew so I was totally ready to go and was one of the first to take a stroke when the horn sounded. That helped me get out early and avoid some of the crush. 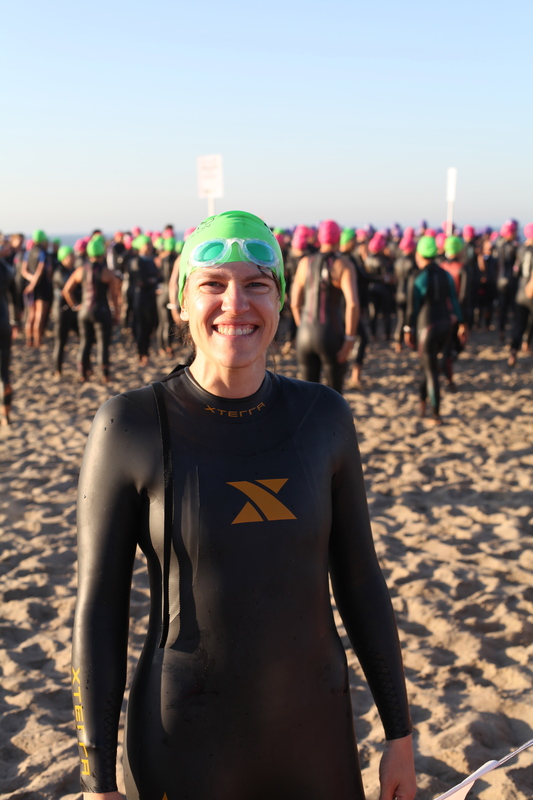 I breathed every two strokes in the beginning and that helped me overcome the trouble I’d had in the past with feeling out of air on the start of an open water swim. 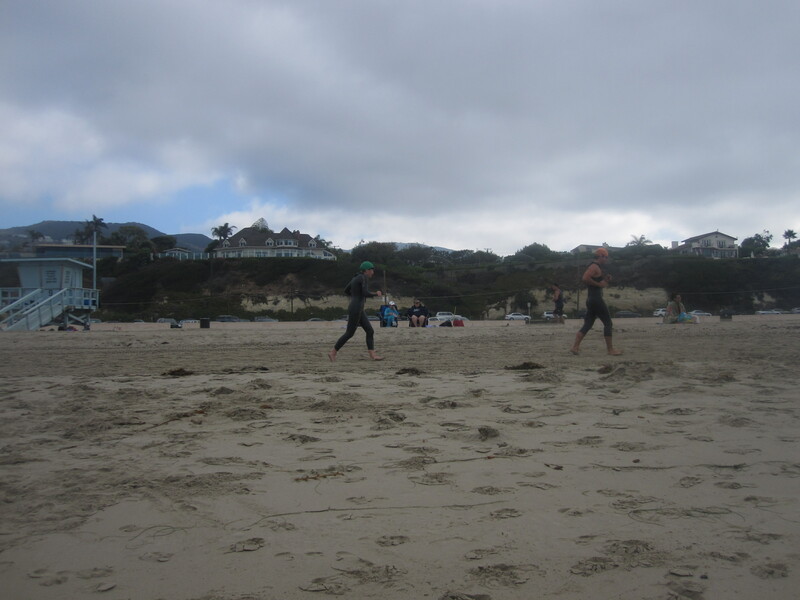 In fact I did less breaststroke on this swim than any of my practice open water swims — I only did breaststroke to sight the buoys and that was just enough to get me some extra air. One girl bumped into me (or I bumped into her — who knows) and I veered a bit left (but on course for the first buoy) to get away from her thrashing. 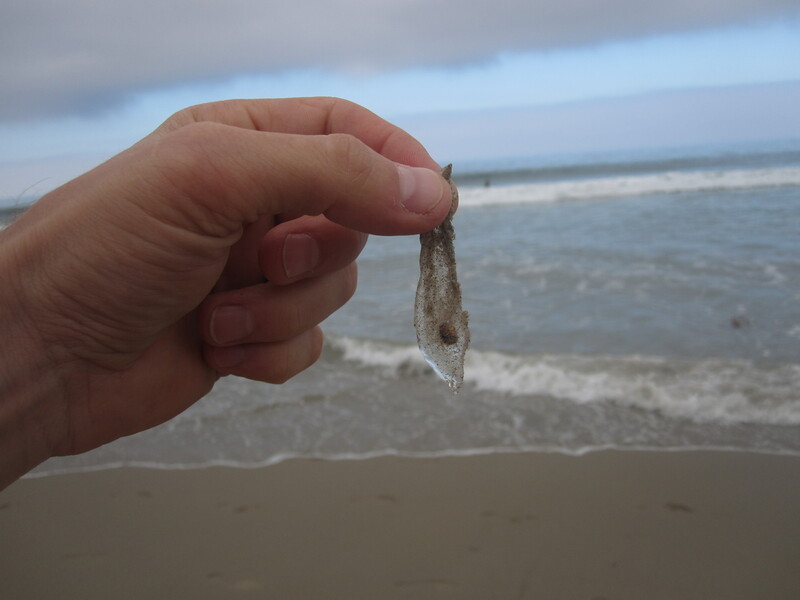 I was pretty free to swim until I started catching some of the stragglers from the previous waves. I ended up finishing with some yellow and green caps from the previous two waves. My swim time was excellent when you account for having to sight for the buoys and avoid the other swimmers. Once or twice I felt held back by people blocking me (not on purpose). My T1 transition time stunk. Partly I chalk my time up to not having tri gear. 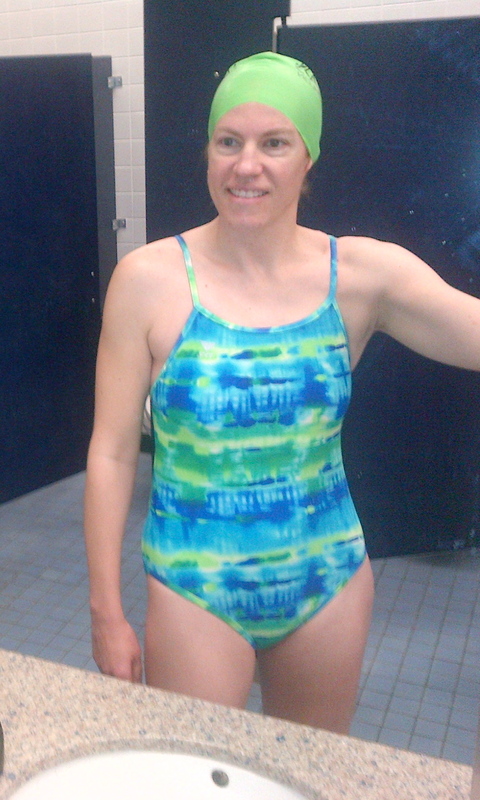 It would have saved time to have a tri suit instead of a swim suit and bike shorts and shirt. I could have gone without my socks (but I like them for biking and running). I definitely shouldn’t have put on sunscreen because it was so overcast. I took an extra sip of Gatorade too and I should have just waited until I was on the bike. I had a little trouble getting my bike shoes locked in the clipless pedals at the mount line. Partly I hadn’t anticipated the race officials yelling at me to keep pedaling. I’m not sure whether they were trying to be encouraging or telling me to get out of the way. Either way it didn’t help. But soon I was off and having a blast on the bike. The ride was so much fun. Loving the ride! Look at that smile on my face! Best part of the race! I booked it and felt great and passed at least a hundred people. 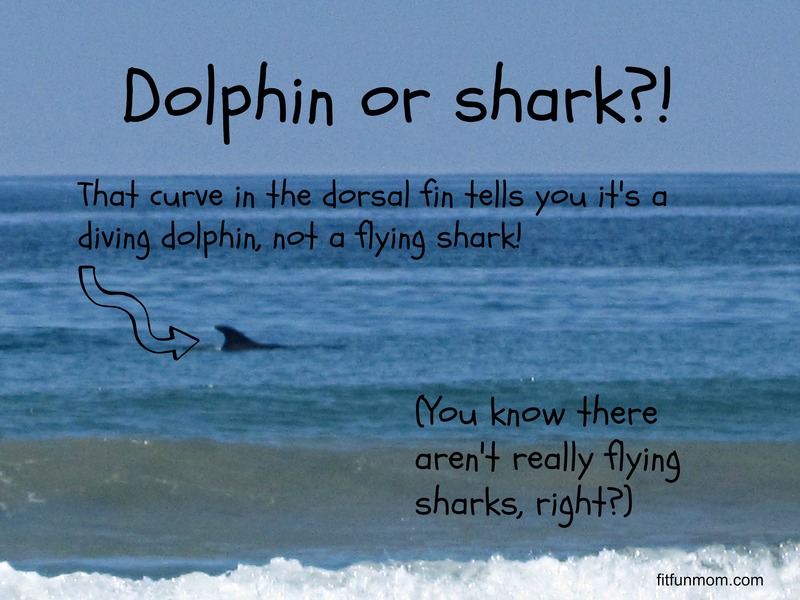 I wasn’t counting but I was constantly passing people and could tell that I was catching people from earlier waves because I could see their wave numbers on their calves. Someone in wave 9 behind me passed me and cheered me on, but then I passed her back and she cheered me some more. 🙂 I never saw her again. At one point she was holding me back and I realized it and decided I shouldn’t let her pace me — I should set the pace. I kept it at 20 mph (although I had no idea at the time – I don’t have a bike computer) and really gave it my all. I knew I wouldn’t be as good as most people on the run and this was my chance to get some time on those people. 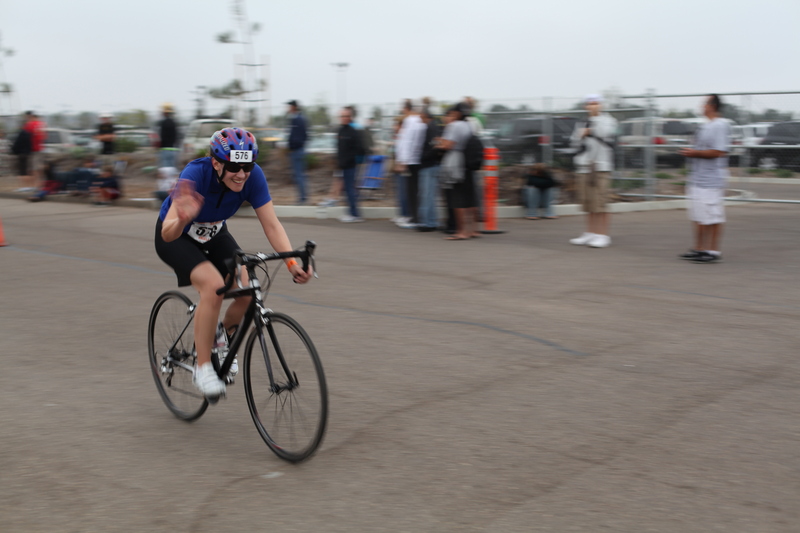 I did great in T2 I think and that was a very good time for me. I tried to grab water from the aid stations on the run but found it was hard to drink from a cup rather than a sports bottle. My legs felt okay and the limiting factor on the run was my lungs more than my legs. I went as fast as I could without exceeding my aerobic capacity, right up until the final stretch when I pushed it harder. I had a secret goal of finishing the 5K in under 30 minutes. When I was on the course I didn’t think I would make it. I felt tired and had no idea how fast or slow I was going. Giving it my all at the finish. It turned out though that I was running at 7 mph and scored a PR with a time of 26:38! 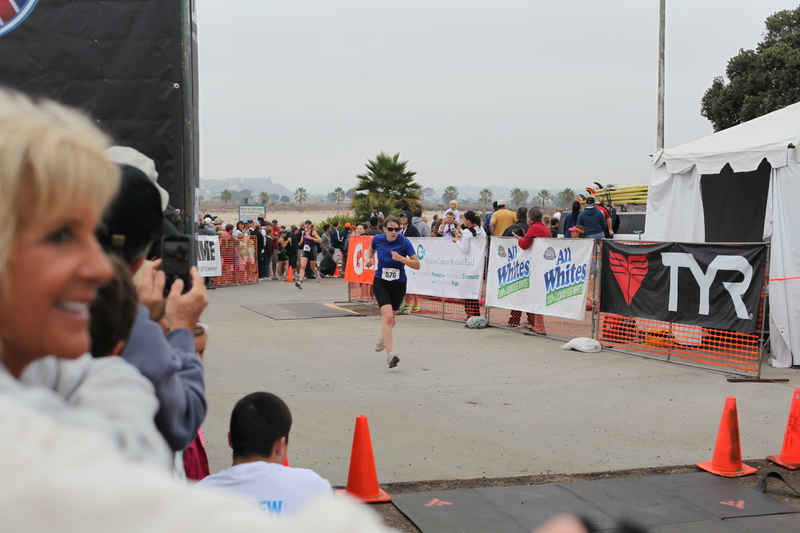 I crossed the finish line with a smile on my face and my arms raised in triumph. I heard the announcer say my name and hometown and that felt great! I grabbed a muffin, banana, orange and a bottle of water. The girls ate most of the food (my three-year-old ate the whole banana!) but I got whatever I could tolerate eating and just basked in the glow of finishing the race and not having any major glitches. I didn’t know my times but we got in line to get a printout. I’m amazed by the technology. I knew right away that I was 22nd out of 121 in my age group and 106 out of 582 overall [those are the unofficial rankings but the official ones are close to that — all in the top 18th and 19th percentiles for finishers]. My total time was 1:23:57 and I’d blown away my secret goal of beating 1:30. The officials only let athletes back in transition so I told Mike I’d meet him and the girls back at the car but I didn’t know where they’d parked. I was too focused on the race to even remember which lot it was. I found them easily enough though. I changed in the car and we headed back to the hotel to pack up and check out. By the time we got smoothies and pizza for lunch, I was exceptionally hungry. I drove the 2 hours home and it was pretty funny because Mike and two of the three girls slept. I was the one who needed a nap! At home I purposely stayed awake so a nap wouldn’t keep me up at night. By 8 p.m. I could hardly keep my eyes open and by 8:30 I was asleep. Overall I am extremely happy with how it went. I exceeded my goals, didn’t have anything go really wrong, and learned a lot. I don’t know how I’m feeling about doing another race. On the one hand, I met my goal with this one and it went SO well. What if the next one didn’t go as well? [Spoiler: It went well too!] And I did not enjoy the nerves before the race. It would be better next time (my mentor assures me) aside from the usual race day excitement. 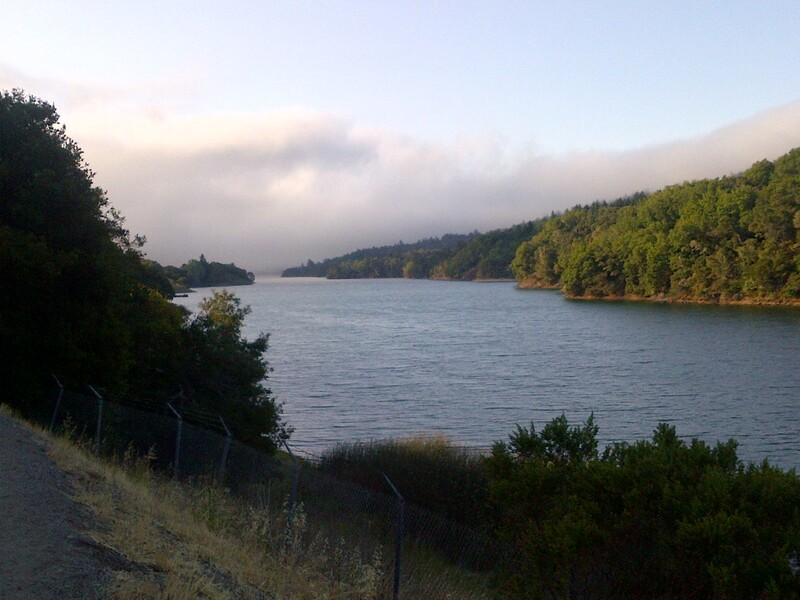 If I do another, should I bump up to Olympic distance? [Spoiler: I did, for HITS Palm Springs 2011 and Nautica Malibu 2012.] That’s what intrigues me. But am I willing to train for that, and what would be the fallout? I don’t want to do something I won’t keep up after the race. I feel like right now I could do the 1-mile swim and the 24.8 mile bike ride. I’ve never done a 10K run and would need to train for that and of course train for doing all three distances in a row. Fun to look back at that first race and my thoughts throughout! I’d never run a 10K, but later went on to race 8K, 10K, a half marathon, and now here I am training for my first marathon! Have you raced SheROX? 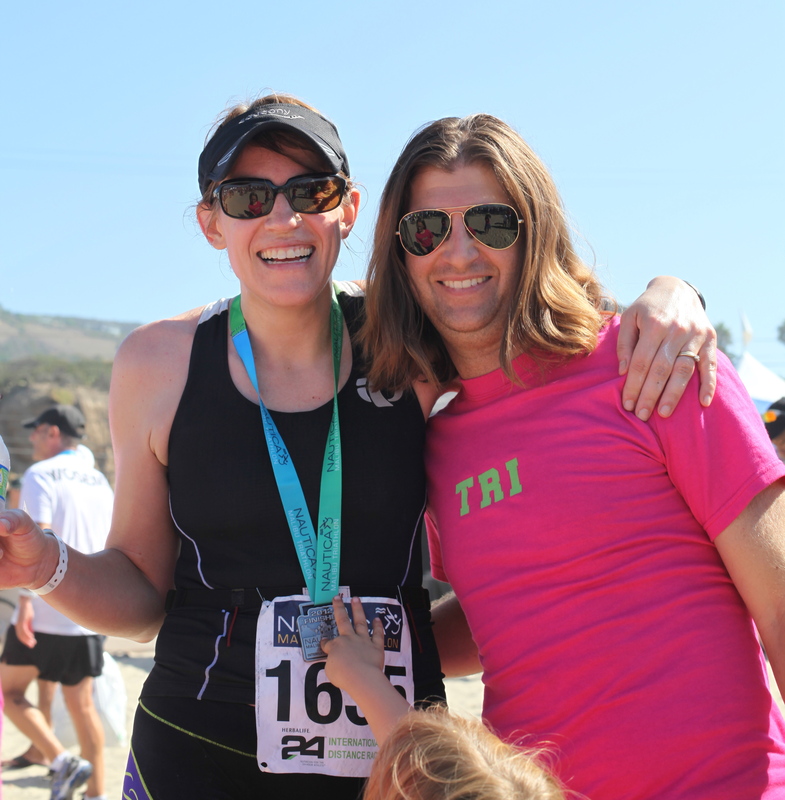 What was your first triathlon like?